Laurie Bassi and her coauthors show that despite the dispiriting headlines, we are entering what they coin the "Worthiness Era." And in it, the good guys are poised to win. Across the globe, people are choosing the companies in their lives in the same way they choose the guests they invite into their homes. They are demanding that companies be "good company." 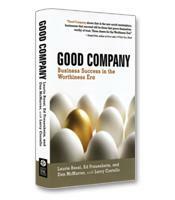 The authors created the Good Company Index to look at Fortune 100 companies' records as employers, sellers and stewards of society and the planet. The results are clear: worthiness pays off. How the business world is changing for the good. How a convergence of economic, social and political forces is now pushing businesses to behave better — or else. How you can assess other companies with which you do business as a consumer, investor or employee. How to determine who the good guys are — those companies that are worthy of your time, your loyalty and your money.